Meet Ray Kroc, the man behind McDonald's Golden Arches and the global fast-food restaurant empire it has become. In this unique audio story, gain new insight on how he came to meet the McDonald brothers who were running a small burger joint. Understand how his experience in business and creative ideas enabled him to develop a vision that would ultimately pave the way for the whole fast-food industry. You'll enjoy this audio story whether you're an entrepreneur, looking for inspiration in your own career, or just enjoy a good story. 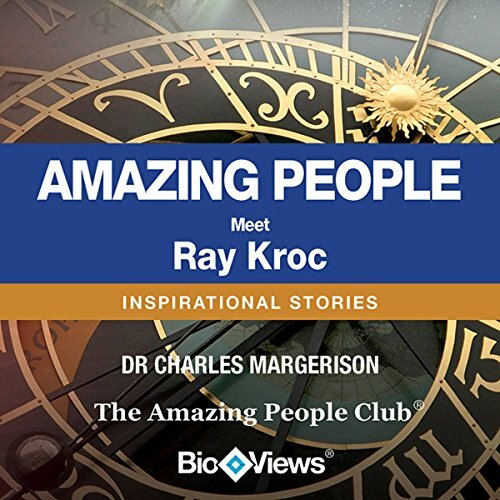 Ray Kroc's story comes to life through BioViews® which are short biographical stories, similar to interviews. These unique stories provide an easy way of learning about amazing people who made major contributions and changed our world. the movie of Ray Kroc, portrayed by Michael Keaton, was just magical and somehow completely messed with what I expected from this audio clip. Loved It, it gave me a better foundation to write my paper on marketing and strategy. Only complaint is that I wish it was longer. Audible, get some books about Ray Kroc in your inventory! !